From time to time, on the forum, we see questions related the use of the pop up flash as an optical wireless controler and its possible impact on the lighting of the scene. Some would say that, as described in the user's manual, the controler flash has no significant impact. Other would say that the controler has a visible effect on the picture. 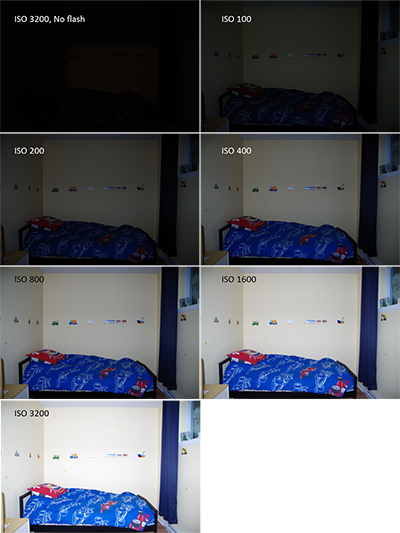 I've made some test myself about this and, based on them, I usually answer that the manual is right, but only at ISO 100. But then I'm usually told that it's not documented, reported, or whatever. So, to help clarify this, I've redone the tests to post the results on PF. All these shots were taken in manual mode, 1/160, F2.8, at 17mm (Tamron 17-50), with a K-500, without any external flash. The only lighting comes from the pop up flash in wireless mode, controler only. I haven't tested with other cameras and it's possible that these results are specific for the K-500, but I don't see why the K-500 would manage wireless P-TTL differently than other Pentax bodies with this feature. But it would be nice if some people could confirm these results with other camera bodies. So, the pop up in controler mode acts as a fixed power flash and thus will be affected by the same basic factors governing flash exposure: ISO, aperture and flash to subject distance. Usually, you don't want to have your choice of aperture dictated by a controler flash. For the flash to subject distance, the wall in the pictures above is about 5m from the controler flash, meaning that significantly increasing this distance will no be practical in most scene. Thus only leaving the ISO setting to keep the contribution of the controler flash to a minimum. This is why I often say that the controler should only be used with the camera set at the lowest ISO possible. This doen't mean it will not work with higer setting. But you're certainly should do a test shot with the controler only to evaluate the controler flash contribution to the overall lighting and if it's acceptable for what you're trying to achieve. I hope this thread will help clarify things about the wireless optical mode and the confusion on its contribution to the lighting. Just wondering how the high iso pics would turn out without flash? This is shown in the first picture, ISO 3200, no flash. At a focal length of 17mm, the distance from camera to subject is short and there are four white surfaces (three walls and a ceiling)to reflect flash. For the built-in flash to work as a controller at longer distances in scenes with less reflected light, it has to output a noticeable amount of light. I've had it trigger an external flash hidden 10 feet away on the floor behind a big, solid chair. Based on your tests, the built-in flash outputs enough light to properly expose your scene at ISO 1600 and f2.8, which isn't a lot. The fact that it overexposes at ISO 3200 indicates that the output of the built-in flash in controller mode is fixed, which is as it should be. If your external flash has a guide number of less than 20, the built-in flash is going to contribute a noticeable amount of light. If the external flash has a guide number of 52, it won't be as noticeable. I often say that the controler should only be used with the camera set at the lowest ISO possible. This is probably still good advice, at least in an automated mode, because I've found the camera will choose high ISO values (up to 3200) to get ambient light to fill in, if necessary. I don't always want ambient light to fill in, especially if I'm bouncing the flash. This is ISO 1000 on the K-1. The slave flash is in the picture with a yellow gel on its grid. You can clearly see the white contribution of the controller flash mounted on the hotshoe. This should be flagged off if it's a concern. I was inspired to try it myself, and waited until nightfall in a fully darkened room. I used F3.5 and was able to just make out a faint glow at ISO 100. On the K7 I did not see the same amount of brightening that you reported .... at ISO1600 I was only getting the white highlights to the half way mark on the histogram. At ISO3200 I had the highlights at the 75% position. So yes, it is there to see. The real question is in what scenario will it have any significant impact? Back in the days of film I wonder how many people loaded up a roll of ASA1600 to assess the effects of controller flash on their prints .... ?!? Usable numbers with no effect? I'd add to your F2.8 / ISO 100 Carl ..... F4 / ISO 200 ..... F5.6 / ISO 400..... F8 / ISO 800 .... F11 / ISO 1600 ( you get the picture). And probably they could all be increased in EV by 1 stop easily, unless there's some mirror or glass behind your subject. So an interesting test and something to consider, thanks again. I will certainly add some more information into my Guide about this, to give more detailed and tested advice on the likely effects of controller flash. I will certainly add some more information into my Guide about this, to give more detailed and tested advice on the likely effects of controller flash. This would be great to have this information available somewhere for all to see. My goal with this thread wasn't to provide an exhaustive list of conditions or settings potentially leading to unwanted light from the controller flash. I only wanted to show that, contrary to the popular belief, light from the controller flash can be registered on the shot if one isn't careful about it. I've no idea how frequently this could be an issue in practical use. But I, for sure, notice it more often since I began to check for it. In fact, I started wondering about this since during a session I bumped the ISO from 100 to 400 to get a faster recycle time. But, in addition to the recycling, I also inexplicably got a "flash in your face" look on my subject and a overall lighting looking completely different than at ISO 100... This wasn't with some kind of exotic setup: main flash behind an umbrella at 45° for a head and shoulder portrait with a 50mm lens... So, I guess more people than we may think are affected by this. Or help people understand why they get different and variable results if they start playing with the ISO, like in this recent thread. Thanks for testing, it's certainly something to be aware of. Why not use one of these doo-dads: Nikon SG-3IR IR Panel for Built-In Flash 4905 B&H Photo Video. Or the DIY version of an unexposed piece of film that's been developed or a floppy disk's innards. The real question is in what scenario will it have any significant impact? The controller flash is supposed to trigger a main flash, right? At what level do we set the main flash so that we don't get a completely blown out image at such high ISO settings? The pop-up flash itself is very weak compared to standard off-camera flashes and its controller output is a fraction of its nominal output. What kind of image are we talking about where the pop-up controller contribution would be actually visible (as opposed to being isolated with extreme settings)? Personally, I don't need convincing that radio triggering has advantages over optical triggering but there is no need to see downsides with optical triggering when, in practice, they don't really hurt. Reflective surfaces, such as glasses or shiny objects, are a different matter -- they can make the controller flash visible in undesired ways -- but regular subjects should be predominantly lit by the main flash with the controller flash contribution normally being vanishingly small. I never said that optical trigerring should not be used or doesn't work. I use it myself from time to time and it does just fine. I'm just saying that people shouldn't blindly assume that the optical controller light will not be visible under all and every situations. And that is really a very good conclusion to draw, and the best advice to give. I will own up to being in the camp that has not ever considered this effect to be at all significant . I have acknowledged the possibility of reflections in glass showing up, but not any residual light actually adding to the total flash EV that is recorded. So I am pleased now to re-consider this, and thanks for the demo Carl and prompting this reconsideration. Personally, I'm not going to ever see any issue ....all of my multi-flash work is of scenes that need some depth and high IQ, so I'm using a maximum of ISO 200 and usually F8-F11. In fact, really, should anyone need to be using anything higher than ISO 200 for multi-flash photography. ....? Does this seem like reasonable advice, and applicable to the majority of likely cases and scenarios ? So, the rule of thumb would be like this ... "Want to shoot at F8? Then don't use any higher ISO than 1600" . Does that seem like a good way to present the guidance ? I would not go as far as to suggest specific settings to use or avoid, even as a rule of thumb. Each situation is different and something that may work in one setup may not work in another one. For example, I've done my test in a dimly lit room. The results might have been different outside or in front of a well lit window where the ambient light contribution would have been much more important than the controller light. I think it would be enough to explain how it works so that people become aware that the controller could contribute to the overall lighting, particularly if working at high ISO values or large aperture, or both. Doing a simple test shot with the controller as the only flash source will reveal any unwanted contribution it might have on the picture, similar to an ambient light test shot. Once someone is aware of this, it's easy to find a workaround to get the lighting right and look as it should be. They will at least know the variables leading to the unwanted light and be able to correct them instead of basing their troubleshooting on the false assumption that the controller flash never contributes to the lighting of the scene. Although it's true that this contribution should not pose any problem most of the time. Last edited by CarlJF; 02-21-2017 at 08:02 AM. Controller flash lighting can be a serious problem with reflective subjects. I once helped a friend get a high-res picture of some framed artwork for a magazine article on the artist. The challenge was that the art was behind glass and the room was pretty dim. To light the art without getting any reflections off the glass, I made a little half-cone of stiff aluminum foil that covered the K-5's pop-up flash with the open-end of the cone pointed toward a larger optically-triggered flash located well off to the side. It worked extremely well at triggering the off-axis flash and as long as I used time-delay and had my finger off the shutter, there were no reflections. If my finger was on the trigger, the side-directed light from the pop-up lit my finger and that created a ghost reflection on the glass (had the room been a different shape, I'd have put the slave flash to the left to reduce the illuminate of the side of the camera).